As our cell phones become smarter all the time, the age old tradition of carrying or wearing time pieces has become obsolete for many people. Most people find it superfluous to wear a watch when their cell phones come equipped with clocks, stop watches, alarms, calendars and everything else you could want. However, time piece design continues to be a productive industry bringing us some beautiful and in some cases, quite creative time pieces. Many of these out of the world watches are created in limited runs and are often already sold to collectors before they are built. 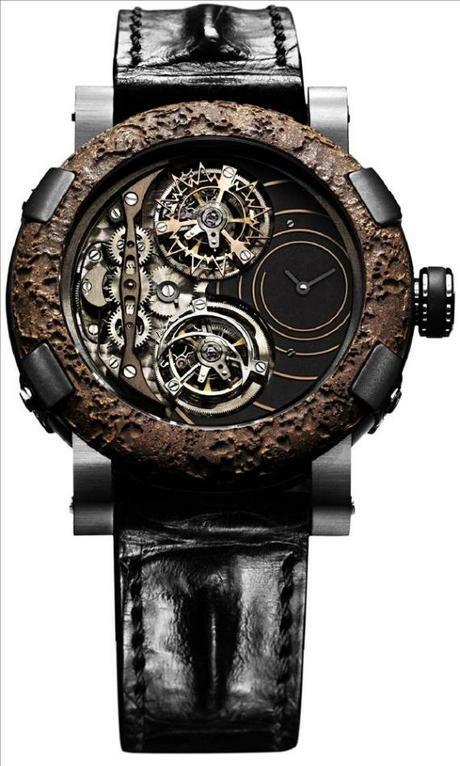 One designer that has etched out a name for himself in the world of high tech collector time pieces is Romain Jerome. Jerome has built his name on watch creations that not only function as practical time pieces, but that also incorporates unconventional materials for truly one of kind pieces of jewelry. Jerome’s business is built upon the concept of sharing with the world little pieces of history encapsulated in luxury time pieces. Jerome seeks to combine excellent Swiss craftsmanship, a sense of historical sensitivity and high tech practicality. Not only are these pieces distinct as luxury pieces of jewelry, but also has historical artifacts that can be cherished for generations. The Moon Dust DNA is one of Jerome’s most outstanding pieces which was created in limited edition of less than 2,000 watches. This beautiful watch actually features real moon dust and other space minerals in the frame of the watch. Another interesting feature of the watch is that the watch glass itself is made of recycled materials from the Apollo 11 mission. The face of the watch has been creatively designed to resemble the cratered surface of the moon. Another of Jerome’s pieces that would appeal to the history buff is the Titanic DNA which was inspired by the famously shipwrecked transatlantic passenger ship. In the same spirit of the Moon Dust DNA, the Titanic DNA actually incorporates real steel and other materials retrieved from the actual shipwrecked Titanic still mostly lying at the bottom of the Atlantic. The visible gear works that can be seen on the watch face resemble boat gears that would have been present on the ship. Most interesting, though, is that the dark coloring of the clock face was achieved by rubbing residue from actual coal that was upon the ship. This is truly a historic, piece of art. Another popular design by Romain Jerome continues to be his iconic Gaming Series. The most popular of this series would the “Space Invaders Series.” This collection of watches encapsulates not only a specific interest line; video gaming, but it also captures a time period of analog gaming that is still dear to the hearts of many aging gamers. The watches come in a variety of colors. The clock face features the famous aliens and space ships from the game. In the same vein as the Space Invaders Series are Jerome’s Pac Man pieces which similarly feature iconic game scenes.